Beautiful Copper colored Redfish caught near Sanibel Island. Redfish fishing is heating up and is in full swing in and around Sanibel Island and Pine Island sound. Consistent action can be found near mangrove islands on the high and falling tides with large schools working the flats and bars during the low tide while fishing the Sanibel, Fort Myers Beach and Captiva Islands. Endless Summer Charters has had awesome success fishing live pilchards (small silver bait ranging 2″-6″) with knocker rigs under the bushes and potholes then cruising the flats of Sanibel on the low tides looking for large schools pushing water or tailing. Free lining baits as well as using a float to keep baits off the bottom is a must. Big chunks of lady fish have worked as well. Catching Redfish in a Refish print shirt is pretty special indeed! This past weekend I had the honor to fish with a group of awesome female anglers who represented Port Sanibel Marina and participated in the 2016 Racks and Reels Breast Cancer tournament. The tournament was an all female event. The twelve heaviest lady fish won the tournament with the addition of a mystery fish being the largest redfish that could be caught and release by the weigh master. My daughter was one of those team members that caught the LARGEST redfish and made me very proud by landing a 7lb, 25.6 inch slot red that won the Calcutta for our team! Nothing better than seeing her big smile after we got the redfish on the deck. We were so excited to get it in the livewell that we failed to take any photos of the redfish! We do however have a photo of Team Coastal Outfitters below. I was honored to captain and guide the ladies to the win! My all ladies team won the Calcutta with the Largest Redfish! The winning angler is arrowed. With cooler temperature slowing approaching SW Florida and rainy season slowly coming to an end, I expect this kind of redfish action to continue well into December. Book your charter today With Endless Summer Charters. We look forward to having you on board. Fall Tarpon – Sanibel Fishing Charters! We are starting off a little earlier than usual with our fall flats fishing trend. Big tarpon have been making random appearances off the beaches, Delicious triple tail are out floating with the left over crab pods and no wake Markers, and what seems like endless amounts of Spanish Mackeral & Jack Creval schools are terrorizing the bait schools off the beaches. All of which will readily eat a lively Pilchard or Threadfin. 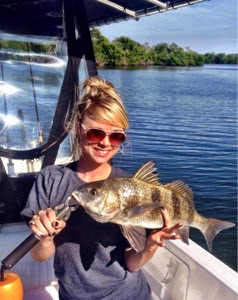 Let’s just keep our fingers crossed for good Sanibel weather to go along with an awesome bite! Been having a lot of rain lately as is expected for the month of August. But with the storms, we also get boat loads of redfish swimming aggressively through out our local waters. Evelyn from Puerto Rico Caught her first redfish ever with us and it was a monster! We caught several fish throughout the morning including snook, redfish, snapper, and jacks! It was a awesome morning flats fishing out on the water. We made it back to the dock just in time to safely watch the thunder storms roll in! Tight lines everybody! Thanks for reading. 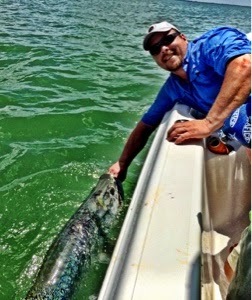 Tarpon Season Sanibel Fort Myers! We are now about a third of the way into our Tarpon season here in SW Florida. Captains Bill and Matt have been doing their job and getting their customers on some big Silver Kings! They’ve been mostly down south off Fort Myers Beach but are working their way up to Boca Grande where these 150 lb plus beauties com year after year. The action has been good and really heating up as June is just around the corner! There are just a few slots left so don’t delay, book your tarpon charter today!